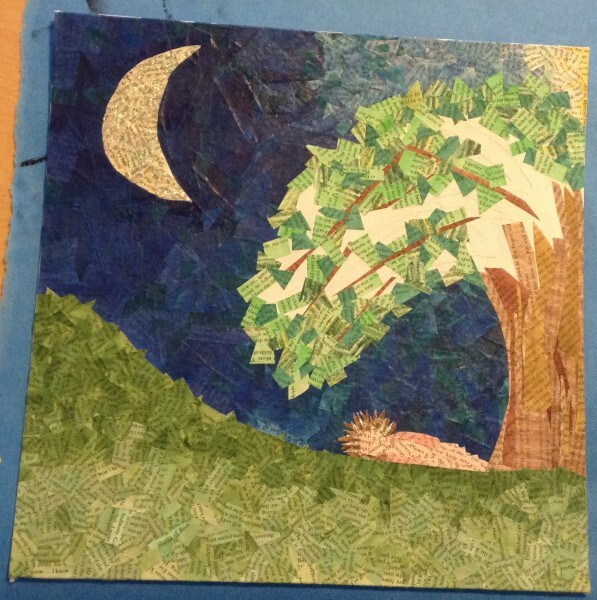 Collage in progress: "The Giving Tree"
I took a photo of my current collage-in-progress today so that I could show it to Shannon, but I thought I'd go ahead and post it here, too. I'm still working on leaves on the tree, of course, and then I'll build an extensive, visible root system throughout the grassy hillside ... and then it'll be done! I may put a small star or two in the vast expanse of dark sky, but I'm not sure. I'm hoping to finish it relatively quickly so that I can enter it into a contest with a deadline on April 18th.